I came up with this strategy due to my market behavior analysis part of studying. The strategy: day trading BNB and ETH pairs to be more profitable, but avoiding over trading. 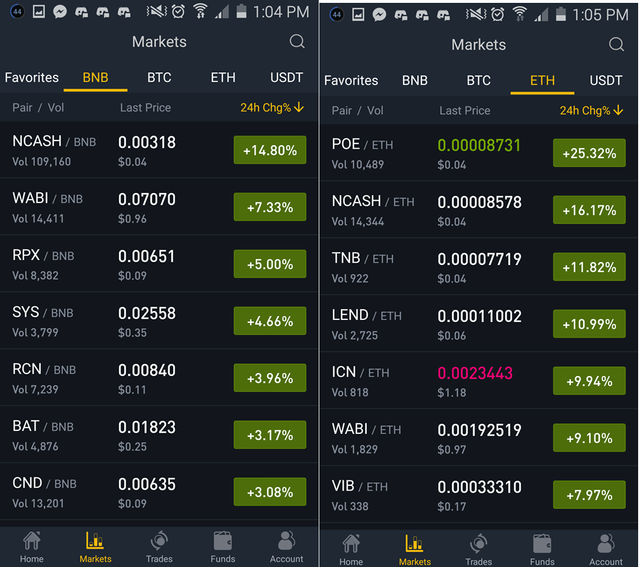 if you will observe the market behavior of each pair, BNB, BTC, and ETH pairs and then you go to the top gainers of the day, you can see that the same coin is the top gainer of each pair, considering if it is listed in the BNB market, because some coins are not listed on the BNB market, and for that you can trade that coin with each pair if you are pretty confident with your trade setup, because if you win the trade you get to keep more BNB and more ETH and prices for each are on a different movement, if on that day the movement of BNB is pretty good, the BNB you won with that trade will cost more and you can also sell it for more BTC, if the price movement of ETH in that day you sell it also for more BTC, but if the price movements of BNB or ETH is not that good that day, you can just keep your BNB and ETH for a while, even if the estimated BTC value of your portfolio goes down, you are still keeping more BNB and ETH becuase you won a trade at those pairs. But I said earlier that you must go with the top gainers, because these top gainers will be easier to predict and go trade them with every pair. As we can see their charts shows the same movement so if I'm pretty confident and it is in the top gainers, I will trade them, but don't over trade. I won to this more than trice in a day because fees will surely burn me and for the profit to be really maximized. 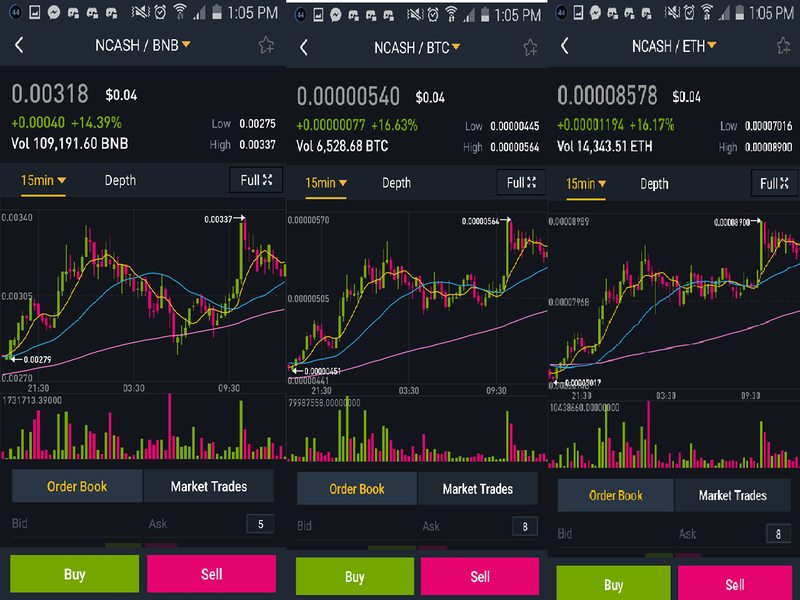 let us take this NCASH as an example and take a look at the price movement with each pair, they are from the top gainers and their price movements are same with each pair. So for example if you traded NCASH with each pair and you won, you won with each. your profit will be really good. this strategy is advisable for those who have huge funds. It will be surely profitable if executed properly.